I've put together this page to give you a sampling of links to useful resources for your Usborne Books & More business: flyers, websites for helpful business items, training documents and more. Simon Dream Builders consultants will also have access to our private team training site, available by password only. I will send you the password in one of your first emails as an Usborne Consultant. The private site has TONS of great stuff! Not a consultant yet? Sign up online here :) You will receive a reply within a short time of submitting your Consultant Agreement. The Booster - business building items such as stickers, buttons and labels. Affordable Business Cards - from vistaprint.com. You pay shipping only for basic card designs. Great starter business cards. 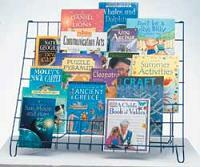 Book Racks - Sturdy folding table racks from Fixturecraft. View the products online, then CALL at 1-800-275-1145 - tell them you are with Usborne and you'll get a nice discount! Ask for model number C793. NOTE - Simon Group Consultants - I give you a FREE Book Rack when you sell $1,500 net and have one recruit in your first 12 weeks of business!